Google has filed a patent for a controller. Well, a notification system for a controller. It will let you know if you've got an invite from a friend, launch an app or even tell you about a leaderboard status change. This also gives us some idea of what Google might be aiming for with its rumoured streaming service, which is expected to be announced at GDC. 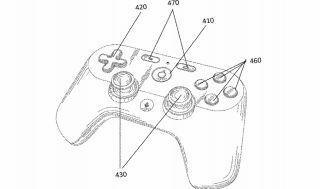 The diagrams accompanying the patent aren't necessarily going to reflect what we see when the controller is properly announced, however. They are examples of what a controller with this notification system could look like. "No attempt is made to show structural details in more detail than may be necessary for a fundamental understanding of the disclosed subject matter and the various ways in which is may be practiced," reads the patent. If the diagrams do represent what the finished product will look, Twitter user Reps has created some renders based on the patent (while filling in a lot of blanks), so you can get an idea of what you'll be holding. Yikes. I think I'll just hide that where I keep my Steam controller. The images were doing the rounds over the weekend, becoming conflated with the real deal, but so far all we've really got to go on are the sketches, which are purposefully vague. Google conducted a technical test of its streaming technology in 2018, letting people stream Assassin's Creed Odyssey and more than hinting that it had some big streaming ambitions. We're still waiting for it to announce an actual streaming service, however, but it's expected to reveal it during its GDC keynote on March 19.